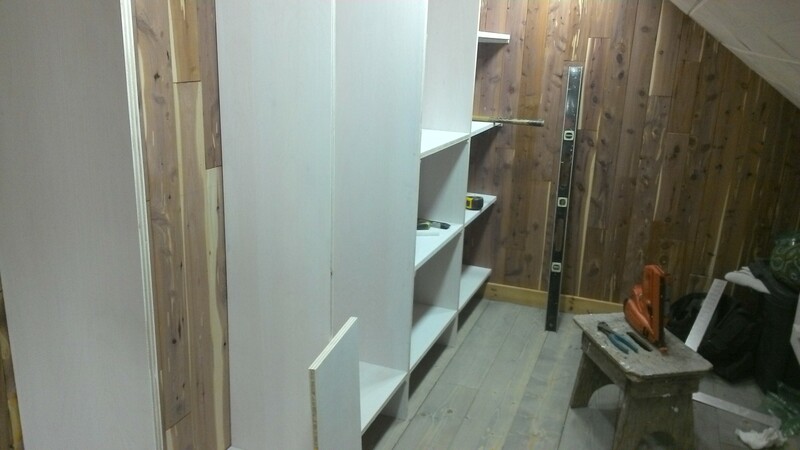 The walk-in closet nears completion, as we progress into furniture-making. I don’t think we’ll do a whole lot of this, but we did build a simple custom shelving system for the closet’s main wall. We cut our uprights and our horizontal shelves from two 4-foot-by-8-foot sheets of finish-grade, ¾-inch-thick plywood. It’s not cheap ($80 apiece I think), so Bob schemed up a shelf plan that wastes almost nothing of the two sheets, and Mark and Hans ripped them very carefully down to the shelves’ not-quite-12-inch depth. These we then cut with the chop saw (slowly, to minimize splintering) to yield sixteen 23¾-inch-wide horizontal shelves and four uprights. These uprights vary in length to meet a floor that isn’t level… The Curse Of The Old House strikes again. 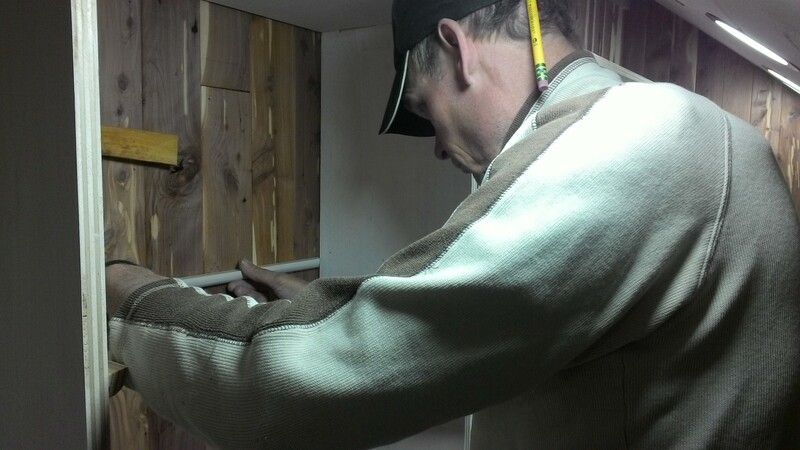 Hans installs a quarter-round shelf support. Hans began our layout on the right side, which gets no upright because we can nail directly to the perpendicular wall. 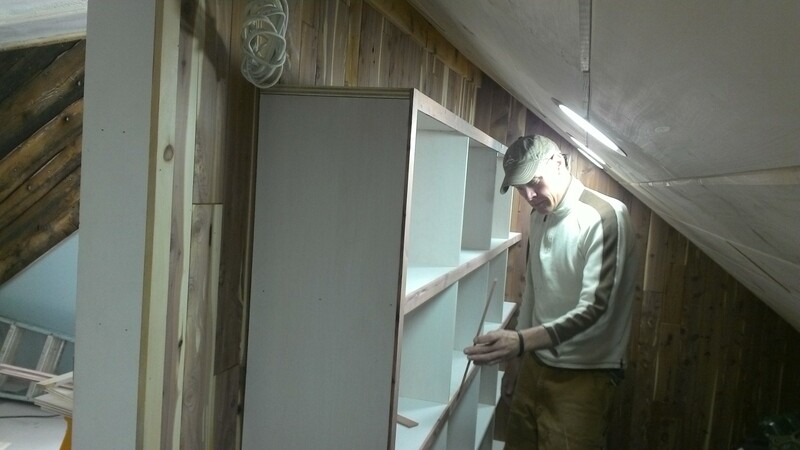 One bay at a time, we cut and installed quarter-round trim as shelf supports, then the shelves themselves, then the next upright. To complete the grid we ran our last length of plywood across the top; it doubles of course as yet another shelf. Next we considered facing. The exposed layers of plywood and the end grain of any wood look unattractive, so we aimed to cover all our cut edges. But how? Mark, Hans, and I all disagreed on the best material to use. A narrow piece of facing would leave a larger opening for access to the shelves, but it wouldn’t fully cover the quarter-rounds. Finally we did the smart thing: we asked the client. Bob chose a nice compromise, and hours later we had faced the shelves with our rich skinny cedar left over from building the closet walls. Cedar facing echoes the wall finish (and smells really good). Plenty of other happenings this week, including the upstairs bathroom and the dormer ceiling. I’ll write about those next time. But it’s nice to finish something, and Suze for one is awfully excited to have a real functional closet.